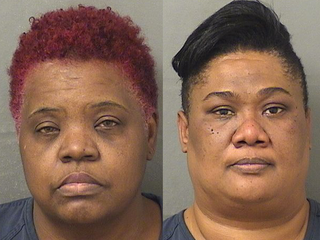 Two caretakers at a Boynton Beach assisted living facility are under arrest after duct tape was used to restrain a dementia patient on July 3, according to a police report. During an interview with the suspects, police said Brudent admitted taking the victim to another patient's room and tying her to a chair and using duct tape on her mouth to prevent her from screaming. She said she was frustrated because of the victim's inability to remain quiet, and she had other patients to take care of, the police report stated. Williams admitted knowing the victim was duct taped and said she had to remove the tape around the victim's mouth to give her sleeping pills, a probable cause affidavit said. Brudent and Williams were booked into the Palm Beach County Jail. They were denied bond on the false imprisonment charge at their first court appearance. Bond on the second count was set at $50,000. Regal Park released this statement: We are taking these allegations very seriously. We are conducting our own internal investigation as well as cooperating fully with appropriate authorities. At this time we have no further information but will make it available as soon as it surfaces. Please understand our first and foremost concern and responsibility is to the continued well-being and happiness of our residents. So what can you do to prevent something like this from happening to a loved one? Karen Terry, a lawyer with Searcy Law, who specializes in nursing home abuse, was appalled to learn about the accusations at the Boynton Beach nursing home. “To tie someone to a chair with duct tape is the most abusive thing I’ve heard since doing this in my practice,” she said in an interview. Before you agree to tour a prospective facility, word of mouth from those you trust is your first step. “It’s critically important to do an investigation to do upfront before you put your parent or loved one in a nursing home or an assisted living facility,” she said. Dr. Raphi Ward is a psychologist with an expertise in dementia. He says when you’re on the tour, meet the people who will be taking care of your loved one. “They’re the people that are on the lower end of the organization so you what to get a feel for who those people are,” he said in an interview. “Check in on you unpredictably, sometimes at night you want to be checked on. Sometimes in the day, you want your family members to check on you. You want the nursing homes to be on their toes and treating you right all the time,” she said. If you are taking care of someone suffering from dementia, it’s hard work-requiring patience and understanding, Ward said. “You have to separate the person from their behavior. That helps a lot of people. It’s not the person that’s a bad person, it’s their demonstrating a behavior that would not be typical of them were they not suffering from the dementia,” he said. The State of Florida can also do background checks. Click here to search by facility type/location to get a list of Florida health care facilities. Call 800-962-2873 to report elder abuse.